Career Goal – My dream job is to teach at UCLA. Running has inspired everything else I do in life. Realizing that I’m capable of achieving the physical goals I’ve accomplished over the last 5 years has spilled over into every facet of my life. I am not afraid to put 100% into something I might once have thought was completely impossible. The Boston Marathon became my dream the moment I crossed my first finish line. It took several years of races, and overcoming an abundance of running injuries to finally get there. My greatest running memory was making the left turn onto Boylston Street at mile 26 of my first Boston Marathon (2013) and running towards the finish line I had worked SO hard to get to for 5 years. The crowds at the Boston Marathon are AMAZING and the finish line is breathtaking. I cried tears of joy the entire last .2 miles of that race. I can’t wait to go back next year!! I am a teacher… helping others set goals and achieve them is my nature. I’ve been fortunate to have so many inspirational people help me achieve running goals along the way. I’ll never forget those who helped me break 4 hours my first marathon, and those who stood by my side and encouraged me as I finally qualified for Boston. I want to help people achieve those same goals! I have only unofficially paced friends to achieve their running goals, but I love the feeling of being out there on the course for someone other than myself. 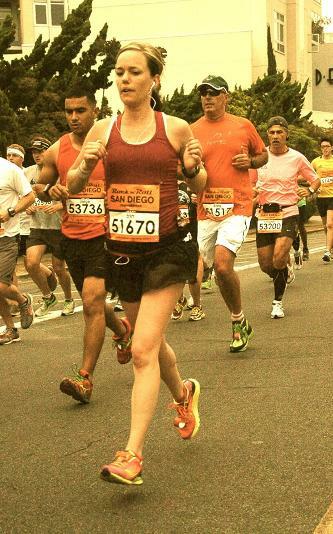 I know how hard running a marathon can be, and I love helping others get through those tough points. Running is about achieving goals, but it’s also about having fun!! For 26.2 miles I will make sure my group enjoys every mile as well as getting to the finish line in time. I’ve got so much personality to share – if my group needs to laugh for 26.2 miles, we’ll do it! If you put in the proper training, we’ll get you to the finish line in time… with smiles on our faces!